Hart Door Systems is a specialist engineering company with a history of over 65 years continuous trading. It delivers door systems that focus across a wide range of industrial and commercial applications including over 40 UK and international airports where the emphasis is on Baggage Handling, Security/Fire and Storage/Access. Hart has a tradition for innovative engineering and offers bespoke design solutions for industrial doors and commercial door systems including prototyping, testing and third part certification. By satisfying client needs, the company has an outstanding reputation. Hart’s doors conform to ISO 9001:2008 international quality standard. Additionally Hart manufactures and installs Fire shutters to British and European BS:EN certification and are USA UL listed. ATEX compliant variants are available for all doors. 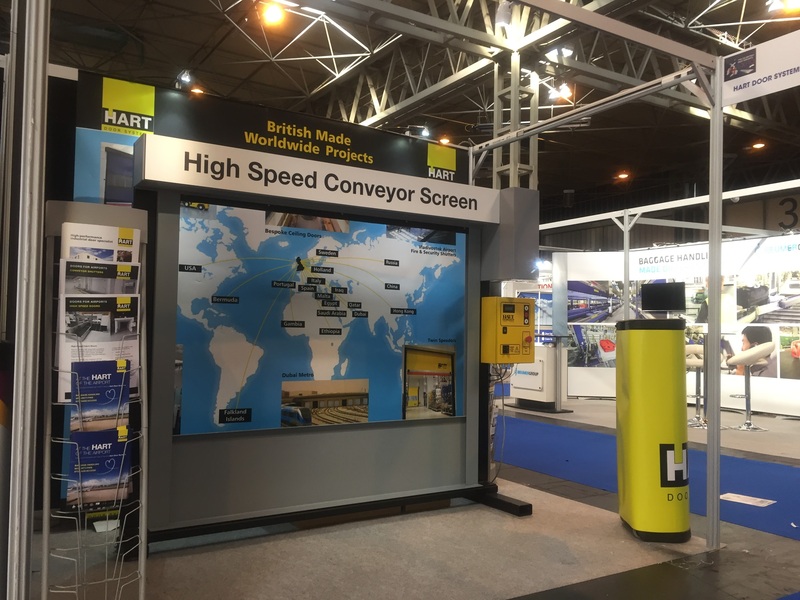 Hart’s brands include Speedor, the high-speed door range which, along with its Baggage Handling, Security/Fire and Storage/Access, can be found on many airports across the globe. These include London Heathrow, where Hart installed forty eight number check-in desks with a unique design, developed for Vanderlande conveyors, combining features from other Hart products namely fire, security and high speed automatic operation. Hart focuses on three specialist areas for Airports. The first is Baggage Handling where Hart’s high-speed automatic shutters protect and complement handling and conveyor systems from smoke and fire threats in a frequent operations environment. This product range covers the vast majority of requirements but we remain flexible enough to work with clients to develop systems for one-off installations. To maintain standards we have introduced a formal system of quality practices, contained in a series of documented procedures which meet the standards specified in BS EN ISO 9001-2008. Further there is comprehensive service and maintenance back-up through the company’s own services teams which continue to grow to cater for large-scale service contracts. 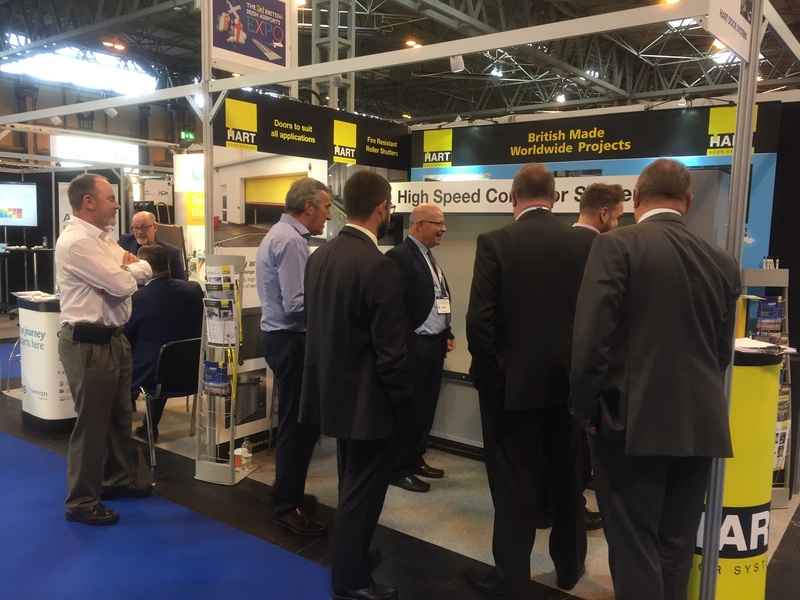 “It’s all about ‘can do’” says Julian Britnell, national sales manager at Hart Door Systems, the Newcastle upon Tyne-based specialist industrial door designer and manufacturer. The ‘can do’ is a reflection on the needs of customers which, by and large, can be accommodated by Hart’s broad product range but at times the requirement to solve a particular problem needs an engineered solution that works time and time again under testing conditions. 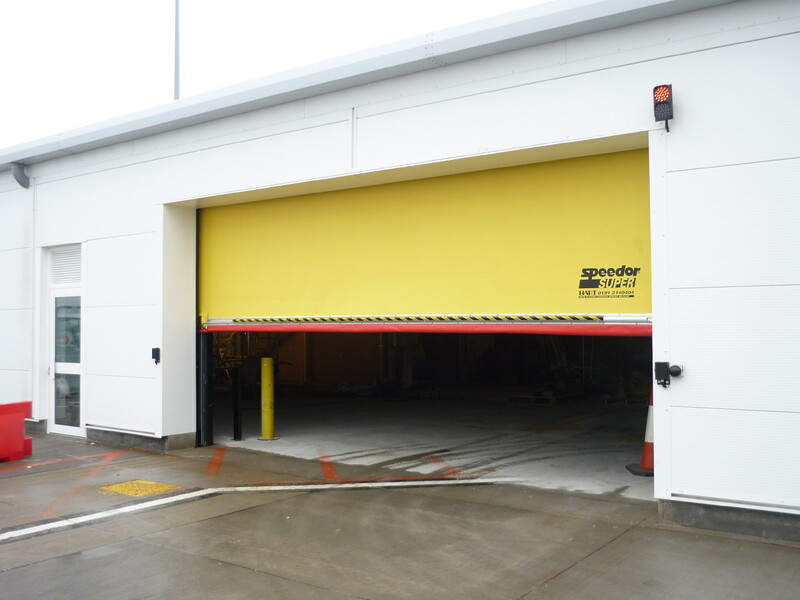 In the UK Hart delivered a range of products, from Speedor high-speed doors to a range of fire and security shutters on contracts at Heathrow, for the Lakesmere, Building Envelope Specialists, where four Speedor ‘Supers’, ranging in size from 2.807m to 3.75m wide to 2.6m high are required, and at Gatwick for Morgan Sindall PLC on the South Terminal Airside Bag Drop Development. As can be seen Hart is active across the globe on airport projects of widely differing sizes. 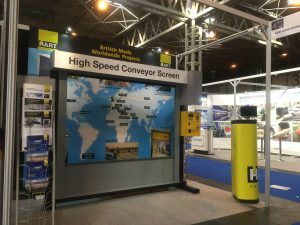 Not only does this success pay testimony to Hart’s product range but to the company’s reputation for delivering British engineered excellence. There are door solutions for conveyor systems, doors that provide security, frequent action, high speed options and that prevent smoke and fire spreading all helping airports with their green foot-print by saving energy. This unique level of product specialism for airports comes from Hart’s policy to drive door systems development, subsequent, exhaustive, product testing that ensures the systems produced by Hart work and are practical. 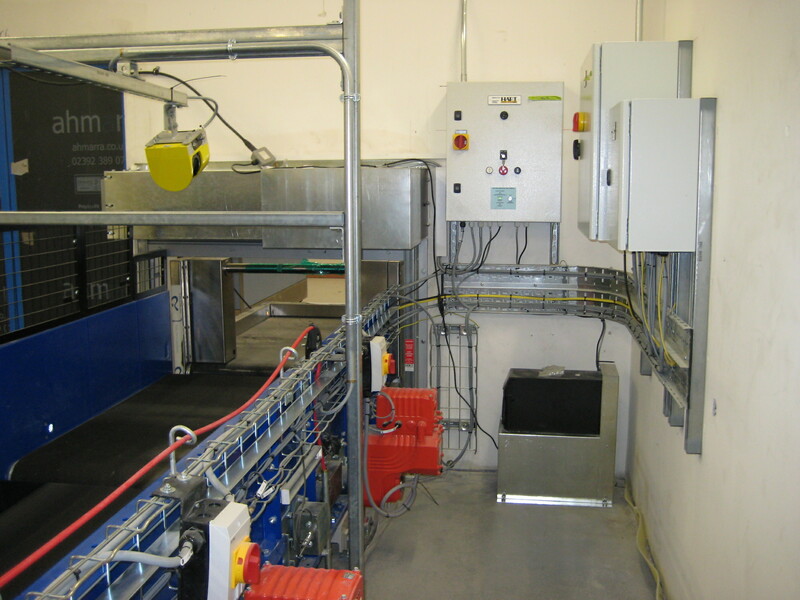 Other examples of airport contracts, Hart, working with Gatwick Airport and the Beumer Group, which provides fully integrated automated high-speed airport baggage handling systems for small, medium, and large airports world-wide, created a unique solution to sealing a fire shutter around the conveyor without a break in the belt system. Working at King Abdulaziz International Airport, Jeddah, Hart Door Systems completed an order for 177 fire and security shutters for the baggage conveyor handling system. Hart was responsible for providing a two-hour fire seal on openings in the firewalls within the terminal. As the conveyors pass through the openings it was necessary to seal them above, from underneath and the sides, to prevent fire penetration. These implications required Hart to complete a further fire test of a completed assembly to UL standards, a world first. Hart also worked with Antemina International on a door project at Baghdad International Airport. This project was an interesting logistical challenge in that Hart had to ship 16 fire shutters, some 8m wide x 3.8m high in five containers to the port at Basra and then by road to Baghdad, a large order, from a weight point of view, of about 30 tonnes. Hart also supplied fire and security systems for baggage handling at Aqaba Airport for Gate Technologies, as well as 12 Speedor ‘Supers’ for Dubai International Airport. A further airport contract is at Casablanca International where Hart has just completed a fire and security shutter installation.